In the world of Disney princesses it seems that all have agreed to get pregnant and now we have met Elsa, Anna and Cinderella attending relaxation classes to help them at the time of delivery. 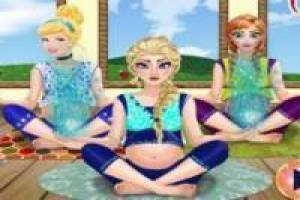 To attend their yoga classes, they will have to wear comfortable clothes so they can not wear their classic Disney princess dresses. Find nice sports clothes for the girls, change their hairstyles and make them look great while pregnant. You can make as many combinations as you want and see how they are going to give one of their relaxation classes. Elsa, Anna and Cinderella are pregnant and we are going to accompany them in this great moment of their lives. Enjoy the game Elsa, Anna and Cinderella are pregnant, it's free, it's one of our pregnant games we've selected.